Technology is taking over and use of advanced technology has become the requirement of business for facing the intense competition. With digitalization, Data Centers has become an eminent part of the technology and a core requirement of the business for competing in this digital era. This also means Data Center field offers very attractive career options and high salary jobs. In recent times the scope of Data Center Jobs has increased exponentially. To make good use of this grand opportunity working professionals and students must look forward to Cisco CCNA, CCNP & CCIE Data Center Certifications. Attaining Cisco Data Center Certifications validates their skills and expertise to administrate Data Center Setups. Now after deciding about taking Cisco Data Center training next big step is to find out Best Cisco Data Center Training Institute. 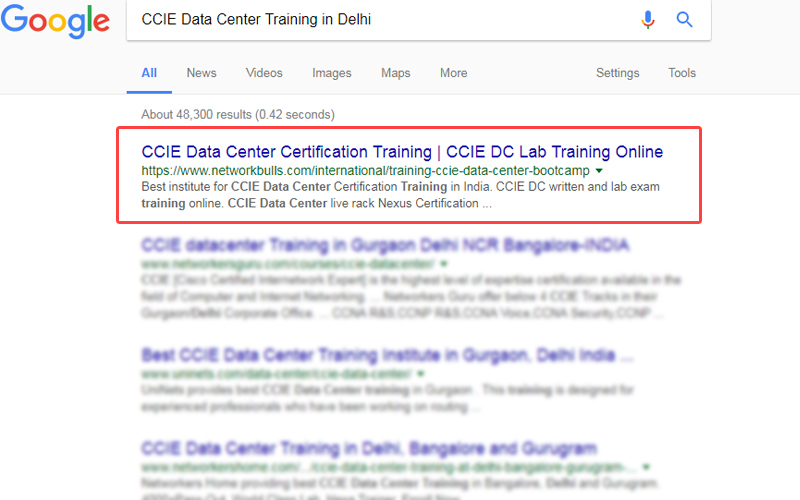 Best Data Center Certification Training Institutes in India? CCNA DC is an associate level course in Data Center Technology by Cisco. 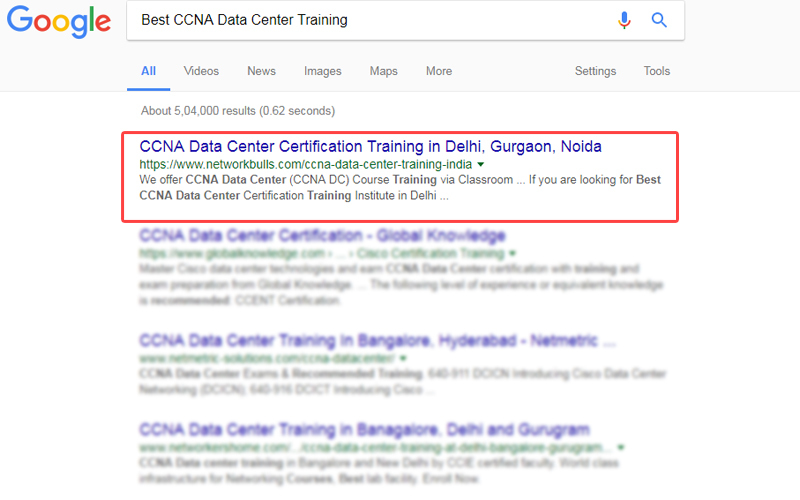 Now Let's look at Google results for "CCIE Data Center Training in Delhi"
All the above Google results answer our question and one prominent name which comes out is Network Bulls. That means Network Bulls is definitely one of the top training institutes for Data Center Certification Training. Let's look at Network Bulls Data Center Training courses in the following section. There is no prerequisite for pursuing Cisco’s Data Center Certification but it is best for the networking professionals having few years of experience and knowledge of Cisco CCNA Routing & Switching. CCNA Data Center Certification is the associate level or initial level certification which introduces you to the basics of Data Center technology. Post completion of your CCNA Data Center training you know the skills of installing, configuring and maintaining data center infrastructure. Once prepared with the topics, students have to appear for Cisco CCNA Data Center Exam and get certified. To test candidate's skills two exams are conducted covering one module each. Exam's duration is 90 minutes for each and generally, 55-60 questions are asked. Once you are CCNA Data Center Certified, you become eligible for entry level jobs in Data Center field and can apply for Data Center Administrator Jobs. CCNP Data Center Certification is the professional level certification which introduces you to the advanced concepts of Data Center Technology. CCNP Data Center Certification is best suited for technology architects, business services architects, pre-sales engineers, design engineers and implementation engineers having around 3 to 5 years of experience. Pre-requisite - CCNA DC certification or a valid CCIE certification in any track is the pre-requisite for CCNP Data Center certification. Post completion of your CCNP Data Center training you will have the expertise to use advanced technologies which include virtualization, policy-driven infrastructure, automation, orchestration, data center security, integration of cloud initiatives and unified computing. Like CCNA Data Center, each CCNP Data Center Module has the separate exam and Cisco gives attendees choice to choose 4 exams out of 5 (for latest DC version i.e. v6). There is a choice amid DCID (300-160) and DCIT (300-180) module. Each exam lasts for 90 minutes and contains around 65 to 75 questions and is only available in English. CCIE Data Center certification training is expert level Cisco Data Center certification which validates your expertise in designing, planning, implementing as well as troubleshooting complex or enterprise level Data Center infrastructure. Pre-requisite - There is no formal pre-requisite for Cisco CCIE Data Center certification but you need to have in-depth knowledge of CCNA Data Center and CCNP Data Center course. Cisco CCIE Data Center written examination is 120 minutes having approximately 90 to 100 questions. It tests your skills of configuring, troubleshooting and diagnosing a complex DC topology. It is a closed book examination so you cannot take any external material for reference. Part 1 is written whereas part 2 is the practical examination to test your practical networking skills. The cost of CCIE Data Center lab exam is 1600 USD. Your expected job roles will include senior level designations as post completion of CCIE Data Center Certification you will be an expert in the domain. Data Center has become an eminent requirement of the today’s IT industry. Understanding the scope and the requirement of Data Center certification in the IT industry, NB has recently launched the Cisco CCNA, CCNP and CCIE Data Center training. 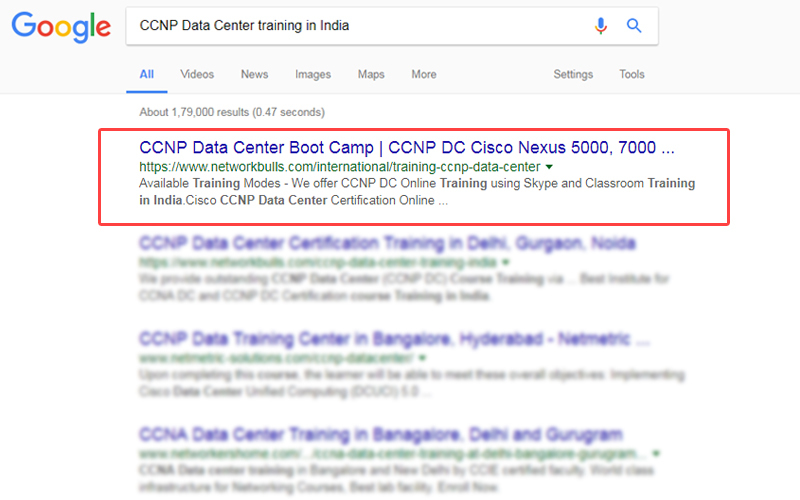 So if you are eyeing Data Center jobs then Network Bulls Cisco Data Center Certification Training can be a big help in achieving your goal. If you are interested in Cisco DC Course or any other networking course offered by Network Bulls then Contact Us on 1800-313-2545 or email us at admin@networkbulls.com. Students from outside India can connect with us over +91-8745885377 / 9540774889. Sucha a wonderful post ever..... Above mentioned screen shots are the truth because I have cross checked on Google and found Network Bulls on top position.